Project executed by invitation of the Museum for Religious Art, Uden. UDEN – A visit to a museum has little in common with the physically demanding task of a pilgrimage to Santiago de Compostela. Taking this discrepancy as a point of departure, Sjaak Langenberg and Rosé de Beer developed their plans for the exhibition A path of stars… pilgrimage & Santiago in the Museum for Religious Art in Uden. The (mental) baggage of pilgrims mixes with that of the museum visitors in the cloakroom. The museum reception counter is set up as a check-point. Many pilgrims gladly share their experience with others, describing their various extraordinary meetings along the way. In order to also turn the museum visit into a collective experience, the distance which visitors traverse during their visit is recorded using pace-counters. 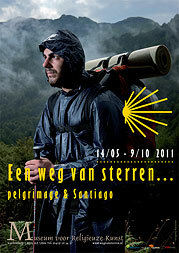 Aware of each and every step, visitors collectively walk the virtual distance to Santiago. Extra meters can be added by using the treadmills provided. Both in the museum and on the exhibition’s website you can follow how their collective effort is making headway.